Submit completed and signed CEI Application Form and the Agreement. If you are not an existing certified trainer for other major certification programs (eg., MCT, CTT+, etc), you will need to pass the CEI Exam. You must be certified in the program that you intend to teach (eg., to teach CEH, you will need to hold the CEH certification, and additionally, if you then want to teach CHFI, you will need to be CHFI certified). Ensure you have updated your EC-Council Continuing Education (ECE) credits through the Aspen Portal as your certification status must be in good standing. An EC-Council Accredited Training Center (ATC) will need to endorse your application. In case there is none, EC-Council may, at its discretion, endorse the application. You must possess technical expertise and hands-on experience with security technologies and applications. When a CEI application is approved, EC-Council will send an email notice to the CEI detailing the access to the CEI Resources and this will be followed by a physical CEI Certificate which will be mailed to the CEI within 2 months from date of approval. If you are not already a certified instructor for other major certification training program (to be approved at the discretion of EC-Council), you will be required to pass the EC-Council Instructor Exam 312-75. Thank you for your interest in applying to become an EC-Council Certified Instructor (CEI). EC-Council will use the information you provide in this application to determine your eligibility. Only completed application with signed agreement form will be processed. Check the Certification Status of any EC-Council Certified Instructor worldwide by writing to [email protected] (No free e-mail accounts please). Send us a mail with the instructor’s full name and we will send you a reply within 48 hours. We have pool of contract instructors available to teach your next CEH/CHFI class. 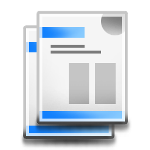 Please e-mail [email protected] with more information about your training requirements. We will be glad to locate an instructor for you. Analyze EC-Council course material and learner information. 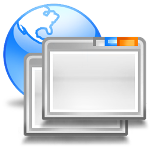 Assure preparation of the instructional site. Establish and maintain instructor credibility. Demonstrate effective questioning skills and techniques. Respond appropriately for learners’ needs for clarification or feedback. How to deliver CEH Course Modules. How to deliver CHFI Course Modules. How to deliver ECSA/LPT Course Modules. Lab Classroom Setup and Student Exercises. Where to take the 312-75 Exam? The EC-Council CEI Instructor exam is available only at ECC EXAM Portal. Please contact your ATC to schedule this test. 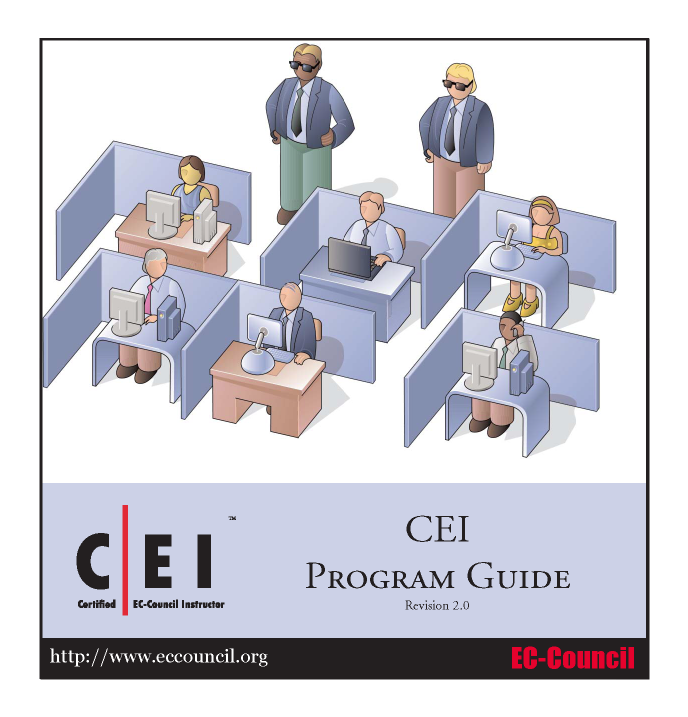 You can order the CEI Instructor Manual which prepares you for the Certified EC-Council Instructor exam 312-75 directly from any EC-Council ATC. We are pleased to announce that the annual EC-Council Global Awards is back. The awards provide recognition and reward to EC-Council’s best performing training partners, institutions and certified instructors across more than 145 countries. Each year, EC-Council honor Accredited Training Centers and Certified Instructors that has made distinguished contributions to the success of EC-Council certification programs and made a difference in the rapidly evolving information security and ethical hacking domain. All ATCs and CEIs are invited to participate for in the awards and stand a chance to win! Winners of the awards will have significant coverage in prominent communication medium. Global Award winners will be showcased on EC Council website, coverage in global press releases. Accredited Training Center and Instructor of the Year will also be given priority referral. Winning entries serve as a resource for future Global Awards entrance. Winning accredited training centers and certified instructors epitomize the industry’s best practices, raise standards and contribute to a growing body of knowledge about information security. Every applicant will be able to see how they perform and learn from their accomplishments. Award-winning training center and instructors high standards of professionalism will be greatly recognized and regarded more prestigious. The good image associated with prestige will increase visibility and profitability and generate good branding. 1. How can I apply to become an EC-Council Instructor? Thank you for your interest in signing up for the Certified EC-Council Instructor (CEI) program. Provide us with a certification from a recognised body that you are a certified trainer or an experience letter from a recognized Academic body/ University/ College where you have been actively involved in training or related services. You must be certified in the program that you intend to teach (eg. to teach CEH, you will need to hold the CEH certification, and additionally, if you then want to teach CHFI, you will need to be CHFI certified). 2. Does the sponsorship letter need to be submitted in a specific format? 3. Do I need to be certified member of EC-Council to become an EC-Council CEI? You need to be a certified member in good standing/ own an Active certificate of the program you wish to deliver to become an EC-Council CEI. 4. What is the estimated duration to approve my CEI Application? The Application process may take 7-10 working days. 5. What is the current status of my Application? EC-Council is glad to inform you that your Application has been successfully processed. We will be sending you all the information you need on the email id mentioned in your application form. If you fail to receive this in the next 48 hours, please write back to us. Please note the Application process may take 7-10 working days from the date of receipt of the above mentioned documents. EC-Council regrets to inform you that your Application has been rejected at this point of time due to the below reasons. 1. 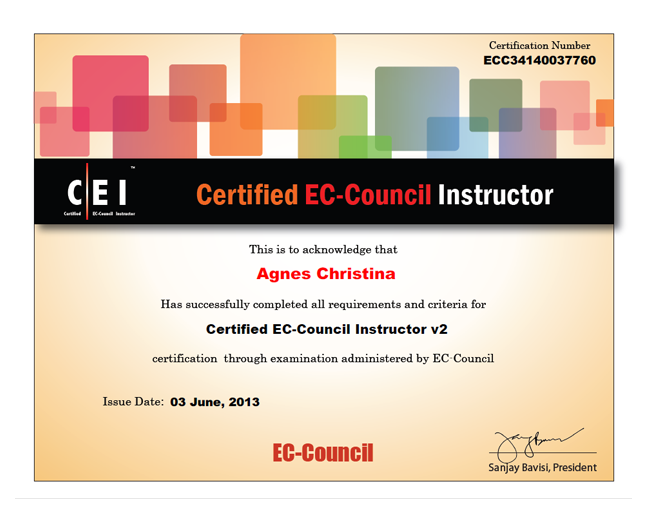 Is my CEI certificate enough to become an EC-Council Trainer? 2. Under what conditions can I lose my CEI status? You do not have an Active Sponsor who is an EC-Council Authorized Training partner. Your certification is not in Active status, which means you failed to comply toward the ECE scheme. EC-Council has decided to end your services based on a case against you which violates the Code of Ethics mentioned in the CEI agreement. This may result in termination without warning. Poor evaluations received on either your instructional abilities or your technical knowledge. And you fail to show evidence to work towards improving these. EC-Council has send you notification’s indicating violation of the process and rules laid in the agreement and you have failed to provide an acceptable explanation or proof to ensure that the actions will not be repeated. 3. What If my sponsor/ training centre is no more and EC-Council Authorized Training provider? EC-Council will sponsor a temp Access for the period of 3 months, so you can ensure you find an EC-Council Authorized Training provider who is willing to sponsor your Application. Failing which your services will be terminated as an CEI. You can choose to reapply when you have all the essentials in place. 4. Will I get a certificate as proof of being a part of the CEI program? 5. Is the CEI certification different than that of the CEI program? Yes, The CEI certification that tests your skills as a trainer is different that of the CEI program which Authorizes you to deliver EC-Council’s training. Below is the sample of how the certifications look like. 6. Are CEI’s Authorized to proctor exams? No, The CEI’s are not authorized to be involved in any activities related to exam proctoring or certification. EC-Council will take strict action against CEI’s who influence the Exam results in any way. 7. Can I deliver EC-Council programs out of my Sponsored Training Centre? EC-Council discourages CEI’s to deliver any or EC-Council programs in with Non- Authorized training partners. If you would like to deliver the program in an Authorized Training Centre, you will need to have special approval from the Training partner who is sponsoring your Application. 8. How can my CEI Certification be verified? All EC-Council certifications can be verified at http://aspen.eccouncil.org/verify.aspx If you face difficulties verifying your cert, kindly write into [email protected] for assistance. 9. Why should CEI’s encourage students to complete training evaluations? EC-Council encourages CEI’s to ensure that each of the students attending the class completes the evaluation and share their feedback via the Aspen Evaluation forms. The Evaluations not only help EC-Council to collect feedback that can help CEIs deliver better but are used during Award nominations and decisions when EC-Council rewards the CEIs. For Students who choose to do training prior to attempt the exam Evaluation forms are mandatory for them to receive their certifications upon passing the exam. For any assistance with accessing evaluation codes, please write in [email protected] with complete details of the student name and evaluation code describing the error received. 1. What additional Material will I receive as a CEI? As a CEI you will receive privileged Access to the instructor material for the program you are authorized to deliver. 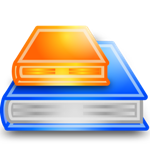 Above that you will also have access to the Frankenstein library where we have all the tools available that you will need to use during your class room demonstrations. 2. I cannot access my Aspen Account? A screenshot will be helpful. 3. I cannot assess a specific file on Aspen? Please help us with the error message you see on your screen while trying to access your account so we can assist you. A screenshot will be helpful. 4. What is waiting period to get additional access on my Account? Please write into [email protected] with the additional materials you need to access. Please note that additional instructor material will only be provided if you have been certified in that specific program. 5. How do I get Lab access? 6. I cannot assess my I-labs account? 7. I am facing or see technical errors with my I-lab access? Please help describe the error you are facing. A screenshot will be helpful.